264 pages, 2 parts, and 6 points of view. With solid details like ten-dollar bills wrapped in aluminum foil. On page one, Rachel is leaving the hospital. On page two, she refers to the accident. What has already happened is revealed (not here) slowly over time, never making us angry or confused and building a picture we want to resist for so many reasons but that ultimately we can’t avoid seeing. With assured echoes from the beginning of the book to the end and from mother to child, The Girl who Fell from the Sky is at the same time a story we have never read before (as Barbara Kingsolver writes on its cover) and a story we all carry with us. It’s so crazy that you often write about my favorite books. This is another I kept in my edit of books when moving to a smaller house. And your quotes were lines I vividly remember. It’s one of those novels to be read again and again. Lovely post, C.
It is crazy : ) I thought this book had such a good feel to it. That’s not very descriptive but there you go. It’s an interesting insight into how she wrote the book. Asking a writer to create a playlist for her novel is a great idea. So glad you left a comment, David. And I’m happy to know about your blog. Also, I love Seven Years by Norah Jones. As you may recall, I loved this book too. Your excerpts were well chosen. It’s terrific to see new talent getting support from old talent. This debut novel would not have been published without Kingsolver’s help and that would have been a great loss to us readers. The Girl is indeed unforgettable. It looks like you’ve been having fun with your writing group in the post below. Nice photos too. Yes, and I remember being inspired by what she said in your interview. 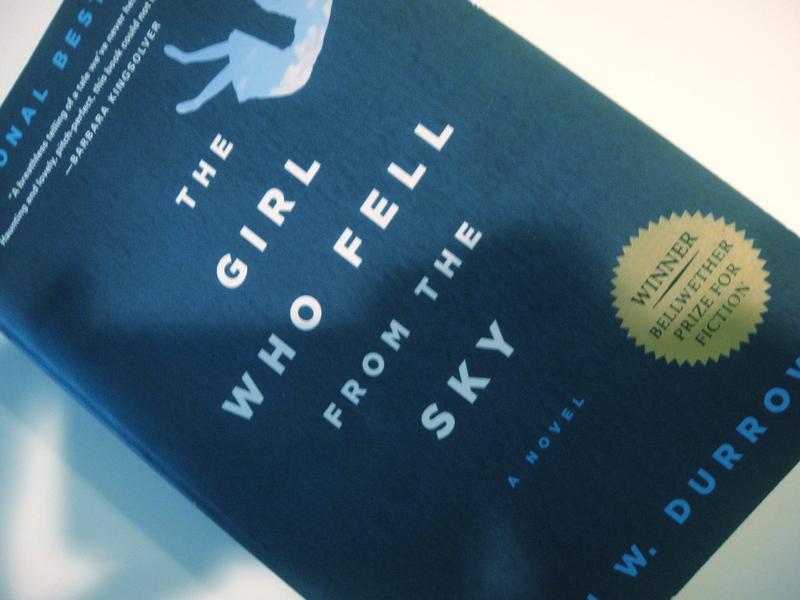 Here’s a link for those who’d like to take a look: http://blog.sarahlaurence.com/2010/06/girl-who-fell-from-sky-by-heidi-durrow.html.